Home / -Vintage Video- / Silver Convention / Vintage Video / Vintage Video: Silver Convention Tops the Charts in 1975 With "Fly Robin Fly"
Vintage Video: Silver Convention Tops the Charts in 1975 With "Fly Robin Fly"
The group Silver Convention was the creation of German producers and songwriters Sylvester Levay and Michael Kunze in the mid-70's. Originally just meant to be a studio group, they scored a hit in the U.K. in 1975 with "Save Me" which made the two men realize that they needed to put together a trio of women to tour behind their songs. They selected Penny McLean, Ramona Wulf and Linda G. Thompson who may not have sung the music on the group's first album, but they were Silver Convention as far as the public was concerned. 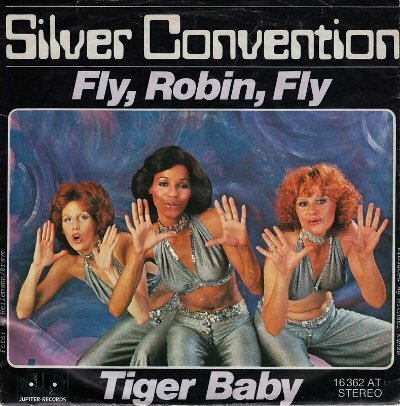 On November 15, 1975, Silver Convention took their U.K. success and moved to the mainstream in the U.S. with their one and only number 1 record, "Fly, Robin, Fly". It hit number 1 on the R&B Singles on this day 42 years ago and followed with a three week run at the top of the hot 100 starting on November 29. Not only was it a triumph for the group, but a major achievement for the German recording industry as it was the first number 1 in the U.S. by a German act. McLane also had her own solo successes at the same time with "Lady Bump" hitting number 1 on the U.S. dance charts (it only reached 48 on the Hot 100) that same year. And just so you know, from your left, that's Penny, Ramona, and Linda.